Esri hosts and maintains weighted overlay services that represent physiographic and ecological data at a global scale. You can use these services in GeoPlanner for ArcGIS to identify locations based on your criteria and answer geographic questions. The World Ecophysiographic Data weighted raster overlay service can help you visualize global ecological variables like distance to water, lithology, and world population. However, you may want to perform analysis using datasets that represent different criteria. Your organization can host its own data on ArcGIS Enterprise in a weighted overlay service. You can then consume that service in GeoPlanner for suitability modeling. This would allow you to share your data and analysis tools with specific groups, organizations, or the public. This document introduces the concepts you'll need to understand to set up your own weighted overlay service. Hosted weighted overlay services are built from mosaic datasets that are shared as image services. This functionality uses various ArcGIS platform tools and components. There are three general workflows you'll need to follow to configure and share your own weighted overlay service. The Weighted Raster Overlay Service toolbox contains analysis tools that will help you prepare and configure your data for a weighted overlay service. Use of these tools is recommended as they will apply the proper fields, properties, and metadata to your rasters and mosaic datasets. Execute the Check Geometry tool to generate a report of the geometry problems in a feature class. Execute the Repair Geometry tool to fix problems found by the Check Geometry tool. Optionally execute the Project_management tool to project all your vector datasets to a common coordinate system. Optionally execute the Clip tool to extract features within your area of interest. This will reduce the size of your rasters and could expedite configuration and processing times. Use one of the tools in the Conversion or the Spatial Analyst toolbox to convert your vector datasets to geoTIFF (.tif). You must use the geoTIFF format. Tools that convert vector datasets to raster require a cell size. If you use a common cell size for all rasters, your overlay analysis may be more accurate. You can calculate a cell size based on the extent of one of your datasets. The following python code snippet calculates a cell size from a feature layer by finding the shortest extent dimension and then dividing it by 250. You can run this from the immediate window in ArcGIS Pro. For each geoTIFF file, execute the Build Pyramids and Calculate Statistics tools. This will help improve performance and accuracy of weighted overlay processing. Raster datasets can contain areas of no data. During analysis, NoData cells mask out cells that they overlay in other layers, which has the effect of removing those raster cells from the analysis. If you do not want this to occur in your suitability models, work through the following steps. The following procedure is optional. It describes how to calculate your NoData values to another value. Add your raster layer to ArcGIS Pro. Right-click your raster layer in the ArcGIS Pro Contents pane. Choose Symbology from the menu. Click NoData Color Picker and choose a color to visualize NoData cells in your raster layer. 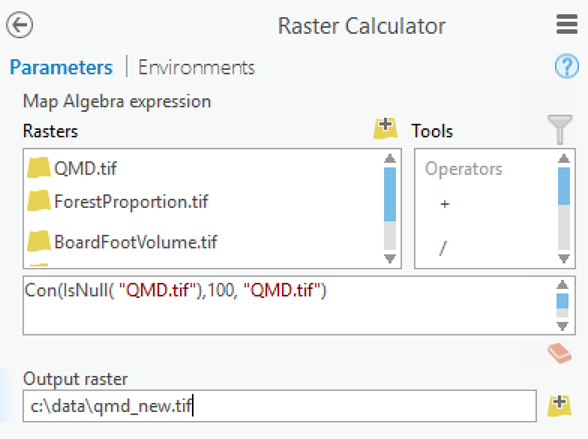 Open the Raster Calculator tool in the Map Algebra toolset of the Spatial Analyst toolbox. In the text input field in the middle of the tool, beneath the Rasters and Tools sections, type Con(IsNull("raster-layer-from-step-1"),no-data-replacement-value,"raster-layer-from-step-1"). In the Output raster field, type a path or browse to a location to store the output raster. Make sure you specify an output file extension of .tif. The Map Algebra expression will replace NoData values with a value of 100 within the QMD layer. 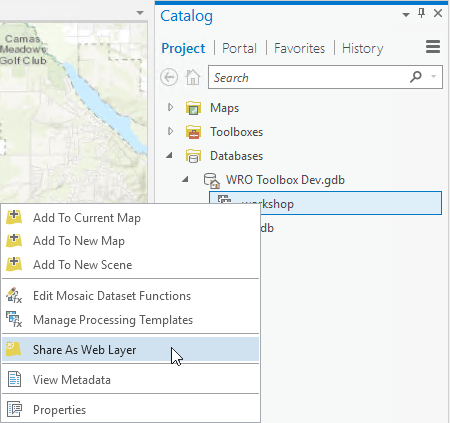 The QMD layer, in this example, is currently loaded in the Contents pane in ArcGIS Pro. This tool creates a mosaic dataset that you can publish to ArcGIS Enterprise. Perform the following steps to create a weighted overlay mosaic. If you have not already, download and unzip the Weighted Raster Overlay Service toolbox. In your ArcGIS Pro Catalog pane, right-click the Toolboxes node and choose Add Toolbox. Browse to the folder that contains the Weighted Raster Overlay Service toolbox. Add your raster datasets to ArcGIS Pro. Optionally configure classify or unique values symbology for each raster layer. The tool will read unique value and classified symbology from each raster layer and write that information to the mosaic dataset. If you do not set unique value or classified symbology, the tool will create equal intervals from your dataset's values and write that information to the mosaic dataset. In the Weighted Raster Overlay Service toolbox, double-click Create Weighted Overlay Mosaic. In the Create Weighted Overlay Mosaic tool, in the Output Geodatabase parameter, browse to a file geodatabase. In the Mosaic Dataset Name parameter, type a name for your output mosaic. 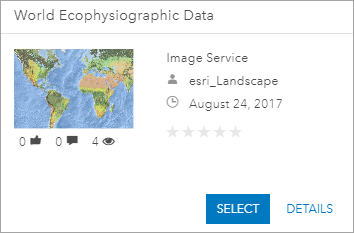 You now have a mosaic dataset that you can share as a web layer to ArcGIS Enterprise. However, you can add some additional information to the mosaic to improve its usability in GeoPlanner and Web AppBuilder for ArcGIS. The following section describes how to change layer titles and classifications and add preview services to your mosaic. If you don't want to add this additional information, skip to the Share your mosaic as a web layer section. The previous workflows have guided you through the creation of a mosaic dataset that you can share as a web layer to ArcGIS Enterprise. This will allow you to create suitability models in GeoPlanner and Web AppBuilder. However, you can refine and improve the information about the layers in your mosaic dataset before you share it. You can change layer titles, update each layer's classification, change each classification's suitability score, and modify a classification's label. The following steps are optional, but they will improve your weighted overlay service's appearance and usability in GeoPlanner and Web AppBuilder. In the Weighted Raster Overlay Service toolbox, double-click Update WRO Layer Classification. In the Input Weighted Overlay Mosaic parameter, browse to the mosaic dataset you created in the Add raster datasets to a mosaic section. 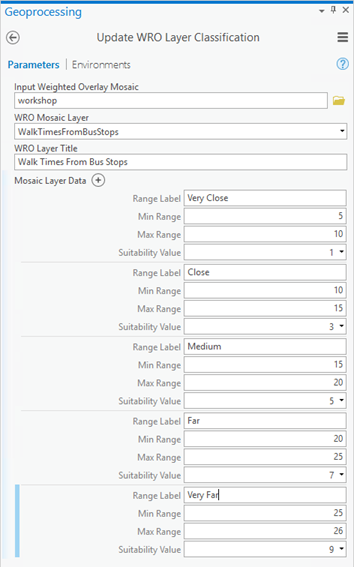 Click the drop-down arrow in the WRO Mosaic Layer parameter and choose a layer in your mosaic. Optionally change the title that appears in the WRO Layer Title parameter. In the Range Label field, optionally change the label that will appear next to a classification in the Modeler widget. In the Min Range field, optionally change the minimum-inclusive value for a classification. In the Max Range field, optionally change the maximum-exclusive value for a classification. In the Suitability Value field, click the drop-down arrow and choose a suitability value for your minimum-inclusive to maximum-exclusive range that you specified in the previous two steps. Your minimum-inclusive to maximum-exclusive range will be remapped to this value. You must choose a value between 0 and 9. Value 0 equates to exclusion of values in your minimum-inclusive to maximum-exclusive range. Values 1 through 9 are subjective. They can signify low to high risk, absence to presence, or low to high opportunity. All of the information you enter in step 5 describes this subjectivity. Ranges must cover all values in your source dataset. Ranges include the min value and exclude the max value. For example, for a range of 0 to 100, the classification includes all values between 0 to 100 but not 100. Ranges must be in sequence. If you delete or add a new range that is out of sequence, the tool will fail validation. Ranges cannot be repeated across classifications. The information listed in the Mosaic Layer Data section is created by the Create Weighted Overlay Mosaic tool. That tool reads unique value and classified symbology from the Contents pane and stores that information in the mosaic dataset. You can modify your symbology in the Contents pane and rerun the Create Weighted Overlay Mosaic tool to create new or change existing classifications that appear in the Suitability Modeler widget in GeoPlanner and Web AppBuilder. Click Run to update a layer classification in your mosaic. You can also change a layer's description, preview URL, informational URL, and NoData value and label within the mosaic. The following steps are optional but will also improve your weighted overlay service's appearance and usability in GeoPlanner and Web AppBuilder. 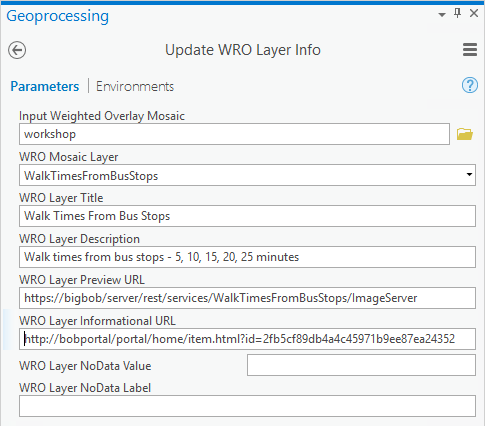 In the Weighted Raster Overlay Service toolbox, double-click Update WRO Layer Info. Click the WRO Mosaic Layer drop-down arrow and choose a layer in your mosaic. Optionally change the title that displays in the WRO Layer Title field. Optionally type a descriptive string in the WRO Layer Description field. The description displays as an information pop-up in the weighted overlay service when the service is accessed from GeoPlanner or Web AppBuilder. Optionally type a URL to a hosted image layer in the WRO Layer Preview URL field. The layer displays as a preview button in the weighted overlay service when the service is accessed from GeoPlanner or Web AppBuilder. Use this field to provide preview functionality for the raster layers in your weighted overlay service's mosaic dataset. You must share each raster layer that you want to preview as an image service. Optionally type a URL to an informational web page about this layer in the WRO Layer Informational URL field. Use this URL for metadata or other useful information about this layer. Optionally, in the WRO Layer NoData Value field, type a NoData value. This value will be considered NoData in your raster layer. If you set a value in step 8, type a label for that value in the WRO Layer NoData Label field. Click Run to update the layer's information. A weighted overlay service is an item that references an image layer. The image layer references a mosaic dataset. In this section, you will learn how to share your mosaic dataset as a web layer. You can share the item with your organization, specific groups, or the public. This functionality allows you to share your weighted overlay service with others so that they can access your content expertise in an analysis tool. In ArcGIS Pro, in the Catalog pane, browse to the mosaic dataset you created. Right-click the mosaic dataset and choose Share As Web Layer. In the Share Raster Data As Web Layer tool, type a name, check the Copy all data option, and type a summary. In the Tags field, type weightedOverlayService. Optionally click Analyze and correct any reported problems. Click Publish to share your service to ArcGIS Enterprise. Congratulations—you have created and shared a weighted overlay service. Consult the Suitability Modeler widget topic to access this service in Web AppBuilder. To access your service in GeoPlanner, review the Modeler topic.